We Are The King of Seamless Gutters! Gutter king of North Florida provides affordable service and installation of Seamless Gutters, Gutter Guard Systems, Rain Barrels and more for all size homes and commercial buildings. We service Jacksonville, the Beaches, Orange Park, and surrounding areas. Gutter King is the top installer of seamless rain gutters in Jacksonville, Florida. Our team of installers is licensed, well experienced and bonded to work in Florida. We care about doing the right job the right way the first time. For us, there is no other way and that is what sets us apart from the competition. Sure, you could hire just about anyone to come to your home and install gutters. In fact, our competitors might even be bigger and they might even be cheaper and faster. But unlike just any old contracting outfit, we care about more than just getting paid – we care about your satisfaction. On top of that, we specialize in gutter installation in Jacksonville, FL. We do gutters and we don’t do anything else. Because of our focus on gutters we are able to install gutter systems that not only work well but also look great. And because we love the Jacksonville area we understand the needs our customers have, particularly when it comes to the heavy Florida rains. How many others out there can say that? Installing gutters is an important part of maintaining and protecting your home. Our innovative gutter systems will protect your home from the harmful effects of the elements and Mother Nature. In addition, our Gutter Guard system helps ensure proper drainage throughout the year by preventing leaves and residue from building up and clogging your gutters. If you live in or near the Jacksonville area and have a need for gutter installation or repair, give us a call. A member of our installation team will be more than happy to visit your home. We provide free, no hassle estimates and can discuss options that best fit your budget and needs. Give us a call and find out why we’re the Gutter King! Gutter King Is Here To Serve You! Rain gutters protect your home from foundation problems, staining of masonry and siding, damage to landscaping and more. 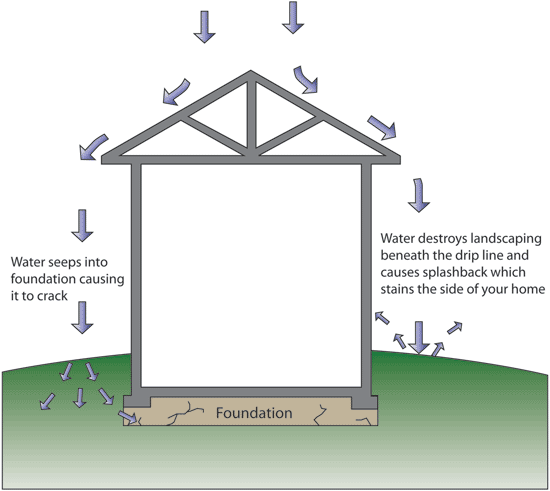 Uneven saturation of the soil around your home’s foundation can cause the soil to heave as it expands and contracts. 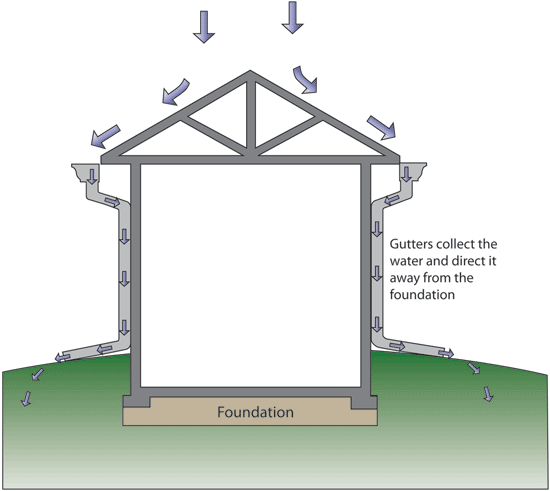 Heaving is a leading cause of foundation failure. In areas with loose soil, the runoff from a rainstorm can literally wash away the soil around your home exposing the foundation. Read on for more ways gutters protect your home.